In the Fall 2017 issue of Preservation magazine, we visit Nashville’s Music Row, a National Treasure of the National Trust, as part of a larger itinerary on historic sites connected to music history. But since there are so many unique and story-rich places concentrated on this stretch of commercial and residential buildings on Nashville's 16th and 17th Avenues South, we’re taking this opportunity to highlight a few more of them. Consider it your personal guide to the Nashville Sound, and keep in mind, all the studios mentioned below are open for tours—just be sure to book in advance. The 1911 Church of the Advent that now houses the Ocean Way Nashville recording studio hasn’t been a house of worship for 45 years, but it’s still a sacred place to those in Nashville’s music industry. The Gothic Revival stone church is said to have housed playwright Tennessee Williams, whose grandfather became the rector in 1914, during his boyhood. 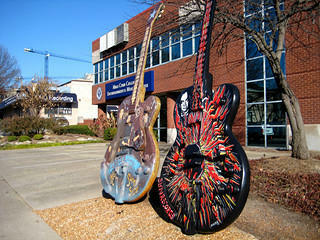 In 2001, Nashville’s Belmont University purchased Ocean Way to house the school’s audio engineering technology program. It continues to operate as a commercial studio, as well as an interactive and hands-on classroom. As a way of raising its stock and diversifying in the era of digital downloads, Ocean Way began opening its sizable recording space (the former church sanctuary) to orchestras, largely for laying down video game soundtracks. That’s not to say it’s forgotten its roots—country artists Blake Shelton and Luke Bryan have both recorded there in recent years. This studio, built by producer Owen Bradley, is legendary among the area's recording studios for being the very first studio along what would later become Music Row. 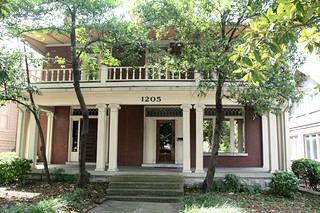 Bradley and his brother Harold bought this former rooming house at 804 16th Avenue South in 1954, stewarding it to its place as the most successful recording studio in Nashville over the next year and laying the groundwork for what would become known as the Nashville Sound. They eventually moved the recording studio from the structure’s basement to the surplus Army Quonset hut that they purchased and attached to the back of the house. The Bradley brothers sold the studio to Columbia Records in 1962, but they continued to utilize it until 1965. Columbia demolished the original rooming house but preserved the Quonset hut, naming the new recording space Studio A and the Quonset hut Studio B. Johnny Cash recorded the original cut of “Folsom Prison Blues” at the Hut, and Bob Dylan recorded the majority of 1966’s Blonde on Blonde there. Studio A and the Hut were closed and gutted for office space in 1982. In 2007, however, Mike Curb of Curb Records purchased the two buildings and restored them, allowing the Hut to reopen in 2009 as teaching studios for Belmont University. Studio A reopened in 2014. Inside House of David Studios, you’ll find a secret passageway built for Elvis Presley. He wanted to be able to enter the recording studio from the alley off 16th Avenue South without being overrun by fans. Unfortunately, The King died before he had the chance to record there, but the secret passage still exists today. Founded by David Briggs, an original member of the renowned Muscle Shoals Rhythm Section, House of David Studios has been located in this circa-1913 house on Music Row since 1974, after Briggs purchased the house for $20,000 in cash two years prior. (Briggs also lived there for a time.) Greats like Emmylou Harris, B.B. King, and Roy Orbison have all recorded at the studio. Specializing in both analog sound and the latest digital recording technology, House of David is a beloved and well-respected spot on Music Row. Briggs has a high pedigree in the city, having also co-owned the famous Quadrophonic Studio, Nashville’s top commercial studio for non-country artists in the ‘70s. In November of 2016, House of David was added to the National Register of Historic Places, ensuring that it will be protected beyond Briggs’ tenure. Katherine Flynn is a former assistant editor at Preservation magazine. She enjoys coffee, record stores, and uncovering the stories behind historic places.